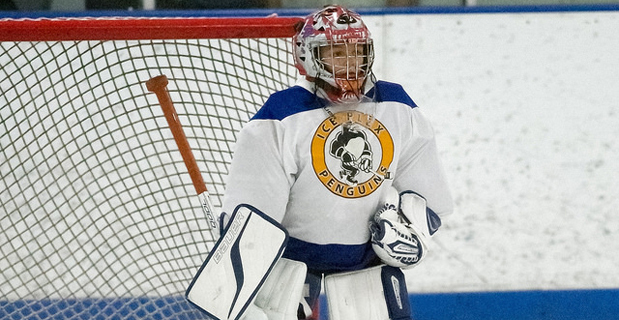 The Cornered Coach – Home Alone: It’s tough being a goalie… and a goalie parent! It's great to return for my third season of The Cornered Coach. This year, I'm back behind the bench in the East York Hockey Association in Toronto, serving as head coach for the 9 and 10 year old Atom "Avalanche" and helping out as an assistant coach with the 7 and 8 year old Novice "Penguins'. The EYHL is a house league featuring a bunch of kids with a wide-range of skill levels. My 10-year-old son Max, for example, is a true "ham and egg" house league player who enjoys hockey but isn't keen on putting in the time and effort required to take a shot at the EYHL "Select" program. My 8-year-old lad Theo, on the other hand, is a middle-of-the-road forward in house league, but is the goalie for the Novice "Select" squad. And that's where this season's opening installment of "The Cornered Coach" begins. Despite being dubbed the East York Bull Dogs, the Novice Select team doesn't play a pile of home games at the East York Arena. Instead, as many parents can relate, we pack a lot of miles on the old SUV travelling around the city to find ice. So, when you do get the chance to play an actual 'home' game, you want to make it count. Unfortunately, however, the Bulldogs have played three games in their own rink so far this year, and they're still looking for their first win. One of the nice things about being a fan in your own rink (I don't coach at the "Select" level) is staking out your own turf. I like to sit behind the net in the last row of the south end zone. As the dad of the goalie, I usually like to watch the game apart from the other parents. Being a goaltender is such a different position than the other players, and if your little masked marvel isn't on top of their game, a couple of things can happen. 1) Stony silence from the other parents after a sieve-like goal. 2) Over-the-top encouragement when your struggling little 'tender DOES make a save. As it turned out, a lot of fellow Bull Dog parents happened to share my neighborhood on Monday and, as fate would have it, Theo had a rough game. The Bull Dogs did pull out a 5-5 tie, but it was against a lower-ranked opponent and Theo definitely gave up a few stinkers. No question, it's tough being a goalie and it's also difficult being the goalie's parents; especially on the nights they're having a tough time. So, if the goalie's parents on your team sometimes strike you as a tad anti-social, cut them a little slack. A lot of netminders need their space in the dressing room to get into the right "head space" to perform. "Oh my god! Our kid is a goalie!" Take care, and we'll chat with you again next week!